Heavy duty casters from the Series 90 are available in both rigid and swivel format, allowing for ideal pairing for steerable applications. Both styles benefit from a protective zinc plating. The heavy duty hot forged top plate and yoke are constructed of 1045 steel. 3/8" thick double welded steel legs provbide for a strong wheel mounting platform. A heavy duty 3/4" axle bolt and lock nut supply secure fastening for the wheel to caster assembly. 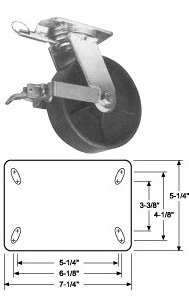 The swivel casters feature a deeply grooved double ball bearing raceway with 1/2" hardened ball bearings. A 1" diameter heat treated kingpin and nut secures the swivel assembly to the top plate. A grease fitting is inserted into the yoke base. Maintenance is facilitated with a hardened and ground spanner bushing with hole and grease groove. Wheels are supplied with grease fitting. This series of heavy duty casters excel when mounted to heavy duty power drawn equipment, machinery dollies, and production fixtures. Further uses include portable steel storage racks, heavy duty workbenches, and die tables. Various caster locks may be included with the Series 30 casters; 4 position swivel locks and wheel face contact brakes. Neoprene seals and sealed precision ball bearings available. Bearing options include roller bearing, Delrin, Precision, ball bearing, sleeve or no bearing. Polyurethane on Steel 1600 NCC-90S625-PUR 24.5 NCC-90R625-PUR 20.25 "
EZ Rolling Polyurethane on Steel 1600 NCC-90S625-EZPUR 26.5 NCC-90R625-EZPUR 24.5 "
6" 2-1/2 Ductile Steel 3500 8 NCC-90S625-DSR 26.5 NCC-90R625-DSR 24.5 "
V Groove 2000 NCC-90S625-VGR 24.5 NCC-90R625-VGR 20.5 "
Ductile V Groove 3500 NCC-90S625-DVGT 26.5 NCC-90R625-DVGT 24.5 "
Phenolic 1600 NCC-90S625-PHR 18 NCC-90R625-PHR 13.75 "
EZ Rolling Polyurethane on Steel 2000 NCC-90S630-EZPUR 28.84 NCC-90R630-EZPUR 26.84 "
Ductile Steel 3500 NCC-90S630-DSR 27.96 NCC-90R630-DSR 25.96 "
Polyurethane on Steel 2000 NCC-90S825-PUR 27 NCC-90R825-PUR 22.75 "
EZ Rolling Polyurethane on Steel 2000 NCC-90S825-EZPUR 29 NCC-90R825-EZPUR 26.75 "
8" 2-1/2 Ductile Steel 3500 10-1/2 NCC-90S825-DSR 29 NCC-90R825-DSR 26.75 "
V Groove 2500 NCC-90S825-VGR 25.5 NCC-90R825-VGR 21.25 "
Ductile V Groove 3500 NCC-90S825-DVGR 28 NCC-90R825-DVGR 25.75 "
Phenolic 2000 NCC-90S825-PHR 21.25 NCC-90R825-PHR 17 "
8" 3 Ductile Steel 3500 10-1/2 NCC-90S830-DSR 28.84 NCC-90R830-DSR 26.59 "
Ductile V Groove 3500 NCC-90S830-DVGR 27.96 NCC-90R830-DVGR 25.71 "
Polyurethane on Steel 2200 NCC-90S1025-PUR 30 NCC-90R1025-PUR 25.75 "
EZ Rolling Polyurethane on Steel 2200 NCC-90S1025-EZPUR 32 NCC-90R1025-EZPUR 29.75 "
10" 2-1/2 Semi Steel 2000 12-1/2 NCC-90S1025-SSR 30 NCC-90R1025-SSR 25.75 "
Ductile Steel 3500 NCC-90S1025-DSR 32 NCC-90R1025-DSR 29.75 "
Phenolic 2500 NCC-90S1025-PHR 24 NCC-90R1025-PHR 23.75 "
EZ Rolling Polyurethane on Steel 3000 NCC-90S1030-EZPUR 37.86 NCC-90R1030-EZPUR 35.61 "
10" 3 Ductile Steel 3500 12-1/2 NCC-90S1030-DSR 34.56 NCC-90R1030-DSR 32.31 "
Ductile V Groove 3500 NCC-90S1030-DVGR 40 NCC-90R1030-DVGR 37.75 "
EZ Rolling Polyurethane on Steel 3500 NCC-90S1230-EZPUR 47.32 NCC-90R1230-EZPUR 45.07 "
Ductile Steel 3500 NCC-90S1230-DSR 42.92 NCC-90R1230-DSR 40.67 "